i am purroud to repurrt that mommie's boo boo is healing tho she smacked it last nite while turning ofur in her sleep. 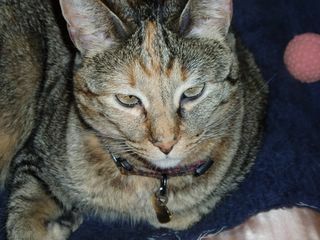 today mommie is going to petsmart to git me my vishus lamb flafurred iams and she sed she would git me a purresent too. i can not wait. tonite we are going to watch shirley mclaine playing coco chanel in a movie on lifetime. Skeezix, are yoo gonna watch too? We bet Shirley Maclaine will be great in that Coco movie. We like her in almost anything. Don't forget the popcorn! I hope you get a fun present! You're so lucky ! Treats from Pet Smart and a Shirley Mclaine movie. Do you ever watch Doris Day? She's dreamy and funny. Oh Honey guess what!!? I am watching Coco right now while I came to visit you! How about that...cool! Thank you so much for making me laugh today with your story...we cats always plan everything for our benefit. I hope your mommies boo boo gets better real fast and never comes back! Mommy recorded that movie and is going to watch it today! I hope your Mommy is OK. That's a terrible BooBoo!